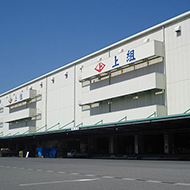 Case Study: 3PL Using Our Warehouses｜Integrated Logistics Services｜Services｜Kamigumi Co., Ltd. Wanted to reduce overland transportation costs. Wanted to reduce costs for secondary transportation from the storage warehouses used to shorten lead times. We used Kamigumi logistics facilities to shorten overland transportation distances. We reduced transportation costs and lead times. We provided 3PL services ranging from import customs to warehouse storage and delivery. We were previously already supporting the customer with duties ranging from marine transportation to import customs after docking and overland container transport. However, the distance from the port to Company A's warehouse was far and the high cost of overland transportation was becoming a concern. There was also considerable distance from the warehouse to the major consuming region, leading to additional secondary transportation costs. The customer also wanted to improve efficiency, as space in the berth previously used was limited, forcing cargo to be taken in and sent out in the same area. In response to these customer concerns, we proposed greatly shortening overland transportation distances by switching to a receiving port close to the major consuming region and utilizing nearby Kamigumi warehouses. In addition to reducing overland transportation costs to 1/3 their previous amount, this also shortened transportation times, allowing for rush cargo unpacking when necessary. As the port is closer to the consuming region, this also helped to reduce secondary transportation costs. Additionally, cargo can now be taken in and sent out in separate areas at the berth at the new harbor, greatly aiding efficiency by increasing the number of containers that can be received in one day as well as allowing for cargo to be taken in and sent out at the same time. In particular, with the increasing number of mail order shipments in recent years, our ability to construct a delivery network comprising not only BtoB but also BtoC was integral to helping the customer lay groundwork for expanding their business. These logistics improvements were also an opportunity for us to pursue modal shifts, helping to reduce CO2 emissions for the company as a result.